Conor McGregor is already among the biggest stars in the UFC with plenty of room to push higher. Firmly established as one of the leading names of the growing MMA organization, "The Notorious" made quite the impact and is not shy about letting everyone know about his ability. 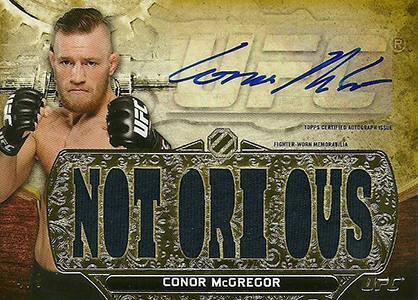 His brash attitude and success in the octagon has Conor McGregor cards on the rise. With Conor McGregor cards in decent supply, there are multiple cards for all interests and budgets. Based on his growing popularity and mainstream awareness, the overall amount continues to grow. Helping that demand is his crossover fight with boxer Floyd Mayweather. The pair are even highlighted in the Topps On Demand set and Topps Now offerings. Shop for Conor McGregor memorabilia and apparel on Fanatics. 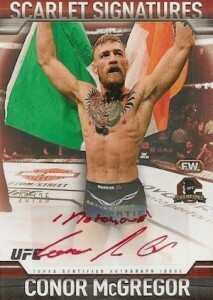 McGregor received his first MMA cards in 2013 Topps UFC Bloodlines. Not only does the release have a base rookie card, but there are also autographs and other inserts. 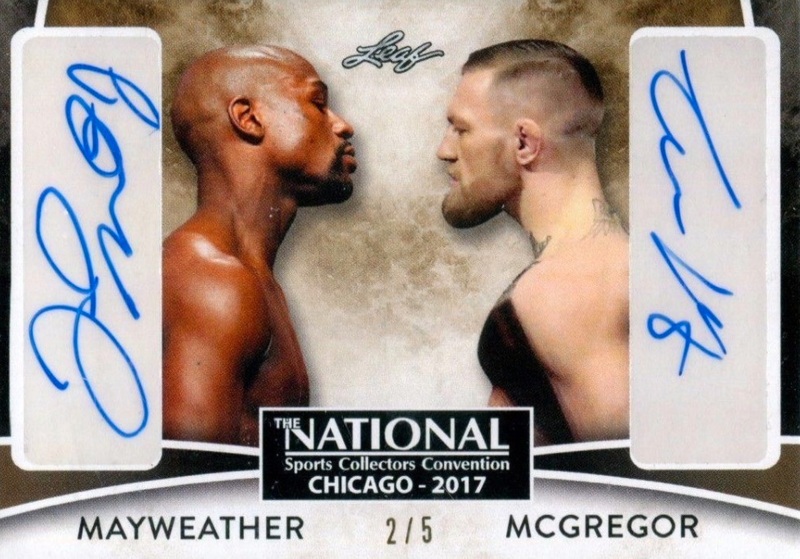 The handful of Topps UFC products each year keeps the amount largely reasonable for collectors, but there are plenty of limited inserts and parallels for McGregor that can be difficult to locate. Below is a list of the key Conor McGregor cards. They might not all be the rarest or most valuable, but they are each significant in their own right. 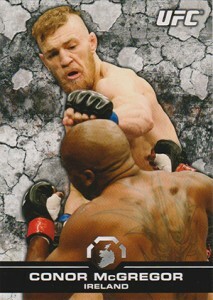 The Conor McGregor rookie card in 2013 Bloodlines shows him going after Marcus Brimage in his UFC debut. The bout lasted less than a bathroom break. This plain card is actually fairly tough to find as boxes come with just 20 base cards. Given that there are 150 cards in the set, it's not an easy pull. The card also has a handful of parallels. Particularly interesting is the Flag version (#/188) that showcases his Irish nationality. 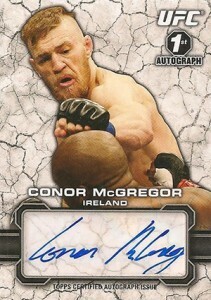 Conor McGregor's debut autograph is also part of 2013 Topps UFC Bloodlines. It's noted as such, similar to the baseball prospect autographs in Bowman. Although the card is not serial numbered and does use a sticker for the signature, it still draws significant interest. It can also be found with a couple of different signature styles. Some have a shortened last name while others have several distinct characters. So this coin can't be used in a vending machine to buy a can of soda. However, it's limited and it looks cool. As a result, it goes for solid amounts on the secondary market—often more than some of his basic relic cards. In addition to the base version that's numbered to 108, there's a gold parallel that has only 25 copies. 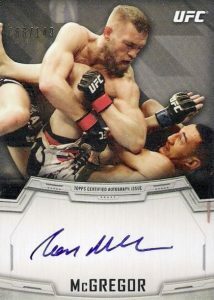 The home of several notable Conor McGregor cards, the base autograph in 2014 Topps UFC Knockout might be his best from the set. A relatively simple design allows the hard-signed autograph to be the central focus and the print run of 149 copies makes it quite limited. 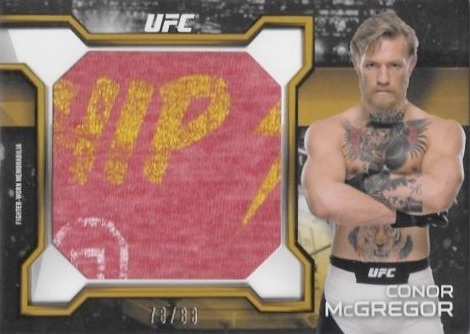 Using the same image, the Conor McGregor autographed relic in 2014 Knockout comes with a piece of gear worn by him. It's got a fairly plain look but the higher print run normally makes it easier to find and more affordable. The belt plate design of the 2014 Topps UFC Knockout Triple Threads inserts is one of the best the brand has ever seen in any sport. While there are a lot more basic relics, the autographed version is a spectacular piece with a very limited print run. 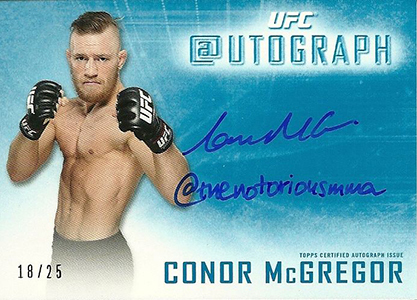 Like all @utographs in 2014 Topps UFC Knockout, this card comes not only with an on-card signature, but it's also inscribed with McGregor's Twitter handle, @TheNotoriousMMA. With so many of his autograph cards coming in the form of stickers, this one is a standout. The added notation and limited print run also work in its favor. 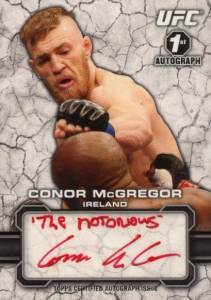 Featuring red ink and a nickname inscription of "Notorious," the Scarlet Signatures card is one of the key options for McGregor outside of his first autograph. 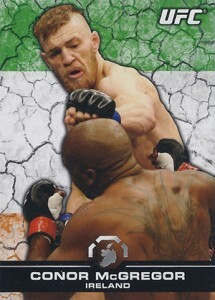 The 2015 UFC Champions card also brings his Irish heritage into focus with the visible flag. Given the low print run of 25, these won't surface often and the only negative is the sticker autograph. 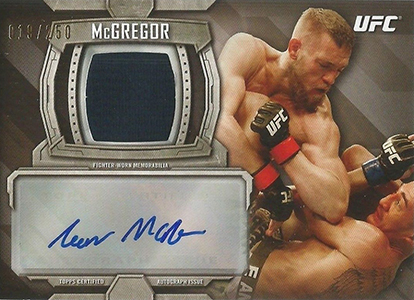 Similar to his '14 edition, the primary 2015 Topps UFC Knockout autograph for McGregor is notable given the appeal of the hard-signed autograph. An unknown print run keeps values from getting out of control and you also get to enjoy his man bun in the action shot. 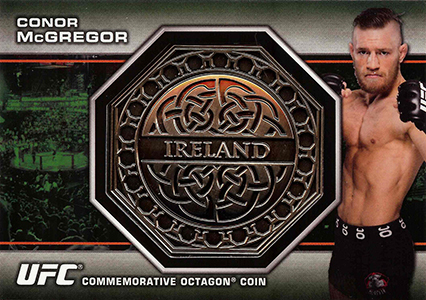 While many of the jumbo relics for McGregor in 2016 UFC Knockout are single-color swatches, the print run of 188 keeps them fairly rare and there are some more interesting versions out there which command big bucks. Gold (#/88), Ruby (#/8) and Mat (1/1) parallels are also in play. The relic variety and parallel choices allows for a wide range of sales prices. 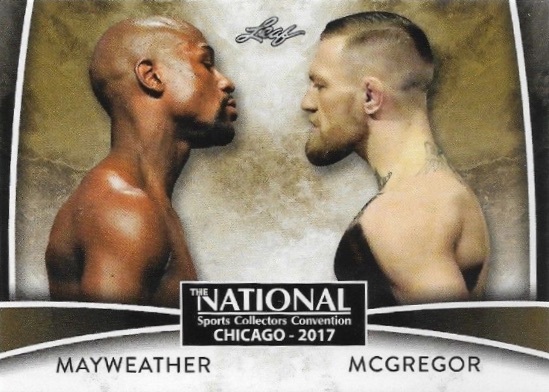 Issued at the 2017 National Convention, this simple Leaf card for Mayweather and McGregor came in VIP ticket packages. The base card version is in fairly decent supply but the signed parallel has only five copies. 2013 Topps UFC Bloodlines CONOR McGREGOR Rookie BGS 9.5 RC 0.5 From Pristine! Ryan Cracknell and Trey Treutel contributed to this article. any idea how much the @autograph is worth?